Reader Question: What is the Difference Between a Roth IRA and an ETF? Home » Reader Question: What is the Difference Between a Roth IRA and an ETF? As long as you keep sending me questions, I’ll do my best to answer them each week (if you’re comfortable letting me). You can ask a question here. I have a Roth IRA that I have been putting money into. I’ve read all about them and I thought I understood it all. Then I decided I wanted to try out some ETF investing. I do both of these things through Vanguard. I opened a brokerage account with Vanguard, but the money I transferred over (and used to buy ETFs) counted towards my Roth IRA contributions. I’m okay with this now, but it has me a little confused. Do I need to open another brokerage account to use money that WON’T go towards my Roth IRA contributions? What am I missing? Thanks for reaching out Solomon. I think the easiest way I can answer this question is to describe a Roth IRA. 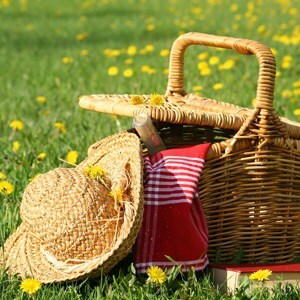 A Roth IRA is a like a picnic basket for your retirement. It just holds everything you need, and has certain rules attached to it. Inside the picnic basket that is your Roth IRA, you can invest in just about anything you want: including ETFs. I think it is confusing because at many brokerages, Vanguard included, you have to transfer money to them first, and then into the Roth IRA. And once it is in the Roth IRA, it still just sits in cash until you do something with it. The important thing is to not pull it out, like you learned the hard way. Once you have your cash deposited into your Roth IRA, you simply pick out the stocks, bonds, ETFs, or mutual funds you want to invest in, and execute the trade within your Roth IRA. There is no need to open another brokerage account just to trade ETFs. Finally, if you’d like more general investing information, you can check out my Investing 101 Resource Page. Readers, do you have any thoughts on the right investments for a Roth IRA? I actually just went through the process of opening up a brokerage account for my Roth IRA with Vanguard, so I think I understand what your confusion is. If you want to invest in stocks or ETFs with Vanguard, you need to do so in a brokerage account, which has to be linked to a money market fund. But your taxable accounts must be kept separate from your IRA, so if you want to invest in stocks or ETFs as part of your taxable investments as well as part of your IRA, you need separate brokerage accounts and separate money market funds. Vanguard doesn’t make this as easy as I’d like, but if you give them a call, they can help you set up the accounts. You should have four accounts total: one taxable account that can hold mutual funds and your money market fund, one taxable brokerage account that is linked to that money market fund, one IRA account that can hold mutual funds and another money market fund, and finally an IRA brokerage account that’s linked to the IRA money market fund. The way I understand it is: investment (ie brokerage) accounts and roth ira accounts are the same in that they are both used for any investments, including stocks, bonds, mutual funds, ETFs, and commodities, real estate. Therefore ETFs are just one of many types of investment you can make in either a regular brokerage account or a roth ira account. The difference is that: brokerage accounts are taxable, roth ira accounts are not(with a few rules as follows); brokerage accounts you can put in as much money as you want, roth ira you can only put in a certain amount per year(it varies); brokerage account earnings can be taken out but as i said, subject to taxation; roth ira earnings cannot be pulled out until you are 59 yrs old and the money has to be in the account for at least 5 years, if you do break these rules the money you take out is subject to penalty. Now why is roth ira called a retirement account? Because it is designed to attract people to save(invest with no taxes) and keep money in the investment (penalties) until you’re near your retirement age.